Rome Termini station is by far the largest station in Italy. It is a sack railway station with 24 tracks next to each other. The building of the central station of the capital of Italy is one of the 5 largest station halls in Europe. The Stazione di Roma Termini, as the station is called in Italian, is located near the centre of the city. There are many hotels and guesthouses around Rome’s main railway station. 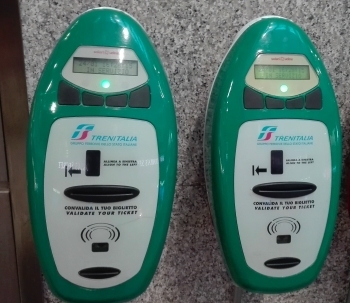 These are ideal for Rome visitors arriving by train. The Statione Termini is not a beauty, but a functional building. The ancient Colosseum stadium, the Fontana di Trevi fountain and the Spanish Steps can be reached on foot from Rome Termini in about half an hour. The Vatican is a little further away. All these sights can also be reached directly from Termini station by underground (2-8 stations, only 1,50 Euro one way). Termini station is very well integrated into the public transport network. The two main subways of Rome meet here (line A and line B). Tram lines and many city buses also depart here. In front of the station Roma Termini there is a big bus station for city buses. 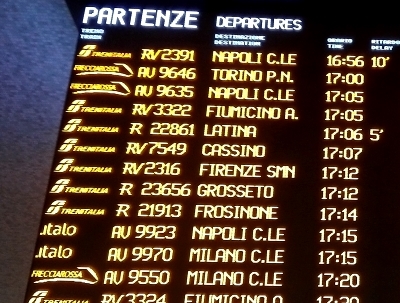 In many places in the station Statione Termini are large electronic boards. Be careful, some of them show arriving trains. The electronic boards with the departing trains are marked with „Partenze“ and English „Departures“. In the second column is the train number. R and RV are for example slower trains, AV faster trains with reservation obligation. These are usually cheaper in advance than on the day of departure. The penultimate column shows the departure times, the far right the delays in minutes. Not all trains are from the state company Trenitalia. Some, especially fast trains, are from other companies, as in the example „.italo“ in the left column. These are often bargains, the tickets for them are available at other counters and ticket machines. If you need a ticket, you have two options, as in almost all large train stations today. You can use a vending machine or buy your ticket at the ticket counter. At the ticket counter you have to pick a number and wait until it is your turn. This often takes a long time at Roma Termini station. We waited about 30 minutes in winter at the beginning of 2019. As far as we know, all sellers at the official ticket counters speak English. German is hardly understood in Rome. Buying tickets at ticket machines is much faster. You can change the machine to German. The operation is relatively simple and not completely different from a ticket machine in Germany. If you want to pay cash, you should be careful to catch a machine that accepts cash. Only about half of the ticket vending machines do this. They are marked accordingly. 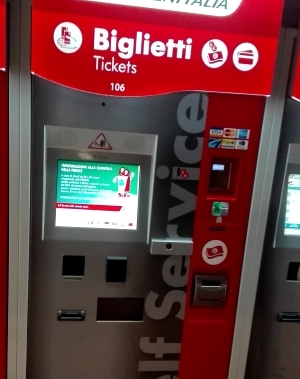 As far as we know, in Rome and the whole of Italy, there are only domestic tickets available at the vending machines. Many passengers in Italy now buy train tickets on the Internet. There are also mobile phone tickets in Italy and so on. All fast trains in Italy are subject to reservation. As with us, there are savings prices for most trains if you buy the tickets a few days in advance. In Italy, for example, the names of the savings prices are „Economy“ and even cheaper „Super Economy“. Very fast trains in Italy sometimes have three classes, often like in airplanes „First Class“, „Business“ and „Economy“. Important: All tickets in Italy must be stamped before departure. The green stamp machines can be found on almost every track and at other places in the station. Push the ticket into the slot in the direction indicated on the ticket until the stamp is released. Before entering the tracks, the tickets are checked at Rome Termini station. You cannot get on the tracks without a ticket. As far as we know, this is only the case in Rome and Milan. One should plan accordingly more time before the departure, mostly there are however no queues here. Many trains in the central station Rome Termini are already ten minutes and more before the departure at the track. There are many departures at Roma Termini station. Fast trains often run several times per hour to Florence, Bologna, Venice, Milan, Naples and other cities. There are also trains from the main train station to Fiumicino airport. These connections with the airport train Leonardo Express are modern and fast, but expensive. Buses to the airport are cheaper, more information here. Most trains from the north also stop in Rome Tiburtina before they stop at Termini station. The central train station Roma Termini, however, is better for most tourists. Rome Tiburtina can be better reached by car. There are a lot of shops in the big station. However, food and drinks are quite expensive in the terminus station Rome Termini. If you need a lot for a longer trip, it is better to shop before or in the surrounding area. We saw a bottle of Coca-Cola (0,5 litres) for 2,75 Euro in a shop in the station. A supermarket of the chain „Conad City“ is about 5 minutes walking distance from the central station of Rome. There 1.5 liters of Coca-Cola cost about 1.50 euros. A tip for a long trip to Germany: In the shop „Hudson News“ in the station Termini there are German magazines like Spiegel or Stern. There are also some shops selling high-quality clothing. There is also a large bookshop, a pharmacy and much more in the Statione Roma Termini. Most restaurants sell fast food. McDonald’s has 2 branches, one in the station and one outside on the other side of the street. Around the station there are a lot of kebab stalls and international fast food like Arabic or Indian food. These are clearly cheaper than the gastronomy in the station. The many guesthouses and hotels around the station are also often a bargain.